Today, companies from the agricultural industry are switching from wooden bins to plastic pallets for their storage and shipment needs. Wooden bins may have been the staple in domestic supply chains and international export, but the industry has discovered that plastic pallet bins are more durable and cost-efficient. The bins come in two versions: solid and ventilated, both of which have their own unique features. Want to know if plastic bins are right for your handling and storing needs? Check out the benefits of solid and ventilated pallets. With tightened regulations placed on food products and increasing demand from consumers for higher quality fruit, it's become more crucial to ensure the safe and hygienic handling of fresh produce like fruits and vegetables. Plastic pallet bins are better alternatives to wooden crates because they're cleaner and safer to use. Wooden pallet bins are made of organic materials that give rise to mould and bacteria, due to the porous nature of the surface and the multiple piece design. Their plastic counterparts are a single piece design, with a smooth interior surface. Additionally, plastic bins are chemical-resistant and do not absorb moisture so they're perfect for shipping perishable and consumable goods. There's no danger of fresh produce getting contaminated – thereby preventing potential losses from rotten products. These pallet bins are also sturdier and more durable than their timber counterparts, especially if they’re made of HDPE plastic. That there are no nails in the plastic bins means no more forklift punctures in the packhouse. Food grade HDPE plastic bins like the Nally Megabins come in different versions: watertight and ventilated. The vented pallets come with air vents on the side and the base, providing ventilation for produce. This ventilation adds valuable shelf life to your produce. Watertight or solid pallet bins allow finer products & liquids to be stored & transported. Both versions can be easily stacked, so they're space-efficient and easy to handle. They can withstand moisture and differences in temperature, unlike wooden bins that absorb moisture. Compared to the nails and splinters found in wooden crates, plastic pallet bins reduce safety risks, and their hand grips allow for manual handling when empty. Their rounded corners and interior smooth surface also prevent fruits and vegetables from bruising and damage thus increasing pack out percentage. Wooden pallet bins are more susceptible to breakages and damage. You’ll be cutting costs by using HDPE plastic pallet bins because of their lifespan and reusability. Plastic bins manufactured from food grade HDPE are strong enough to handle heavy loads without suffering damage. The bins have over double the useable lifespan of wooden pallet bins. Despite the higher initial cost of investing in plastic, these pallets cut costs by providing a far longer service than wooden crates. They are also easy to recycle, as a broken plastic pallet bin can be re-ground to make a new one or to make other plastic goods. Do you want to get both versions for your farm? A.I.M. Sales offer large plastic bins that are now used across many sectors for their handling and storage solutions. They’re manufactured from food grade HDPE and are compatible with most bin handling machinery and pallet jacks. 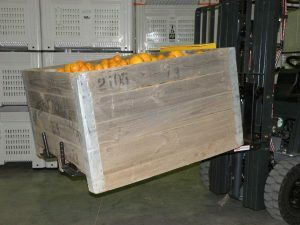 Available in vented and non-vented versions, they have a unique design with a larger forklift entry height than wooden bins. To know more about our Megabins, contact our friendly staff on 02 6964 4688 or email info@aimsales.com.au for queries.